Photo by Maria Matson/Whidbey News Group Kyle and Sarah Bingham work at Campstuff Coffee four days a week. Bingham wants to sell you more than just a cup of coffee. 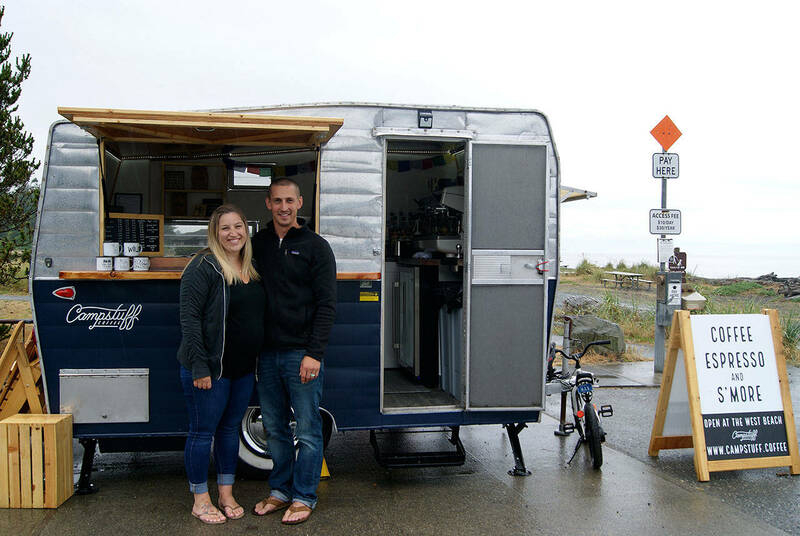 To him, his business is about selling an experience: a warm cup of joe while visiting Deception Pass State Park, creating memories of a cozy drink experienced while in the great outdoors. He wants people to “get outside and enjoy life,” Bingham said. The mobile coffee stand has only been open for three weeks, but already, business has gone “better than expected,” Bingham said. In the mornings, the small coffee trailer is located in the Deception Pass Lower Loop Campground, and moves to West Beach in the afternoons. It’s the perfect spot for them to sell coffee, and the frequent overhead jet noise is no problem, Bingham said. In fact, he and his wife Sarah welcome it—he is happy to see the navy aviators keeping them safe, he said, and the Campstuff Coffee offers discounts for military, police and firefighters. His life is all about adventure—the adventure of running a coffee stand with his wife of eight years, the hiking exploration he does in his free time, and running his other business when he’s not at Campstuff Coffee—Unavita, a small travel company where he leads groups on trips around the world. Bingham is always ready to chat with customers, and on a sunny day he said you will likely find him sitting out on a wooden lawn chair by Campstuff Coffee, reading a book from his personal library, and if you’re interested he’ll let you borrow one of his books too. Sarah Bingham has been in the coffee business since high school, and between the two of them “she’s the coffee pro,” Bingham said. He handles the business operations, and she works on whipping up the drinks—“so we’re combining our strengths,” he said. The outdoorsy couple say they enjoy their location rain or shine. The mobile stand is made from a vintage 1966 Shasta trailer, redone to suit their needs. “We totally disassembled it and put it back together in the shape of a coffee stand,” Bingham said. The couple painted, sanded and polished it, changing the outside color to blue instead of white. On the Campstuff Coffee menu there’s a variety of drink options, including a s’mores mocha, caffé mocha, brevé, white chocolate mocha and classics like an Americano or drip coffee. For non-coffee drinkers, there’s an Italian soda. They’ve had customers who have bought the mugs and sent in photos of them traveling with them, Bingham said. Campstuff Coffee is active on social media, with a blog, Instagram and Facebook page, all aimed at getting people outdoors as well as selling coffee. The Binghams estimate that on busy days, they get several hundred customers and on slow days, between 75 and a hundred. Sundays are their busiest day, Sarah said, and they get customers from all over the U.S. who are visiting Deception Pass. “We’ve met people from Maryland and Canada and that’s just today,” she said. If they had to choose a favorite item off their menu, Sarah said she’d go for the simple Americano. Campstuff Coffee is open Friday through Monday. Photo by Maria Matson/Whidbey News Group Campstuff Coffee is a mobile stand. in the morning, it is located in the Deception Pass Lower Loop Campground and moves to West Beach in the afternoon.